The massive broadswords from Medieval and Renaissance era are the inspiration behind this historic two hand broadsword. These oversized edged wonders bore witness to many defining moments throughout the ages, forever etching their place into the pages of history. This inspired replica pays homage to that legacy in stunning detail, starting with the massive blade. A mirror-polished blade finish, oversized guard and decorative pommel give this formidable sword a refined, elegant look and feel. Traditional touches such as the heavy blood groove and stacked handle add authenticity. It's a realistic interpretation of the fabled broadswords of old at 45" from end to end. Wow I am so glad I bought this it is awesome and heavy duty Thanks Bud K you always impress me with your deals. Way too heavy - two handed? they're not kidding, and with no sheath, I guess I'll have to hang it and hope no intruder gets to it before I do. Not sharp? doesn't matter - the weight of this beast would knock out anyone! 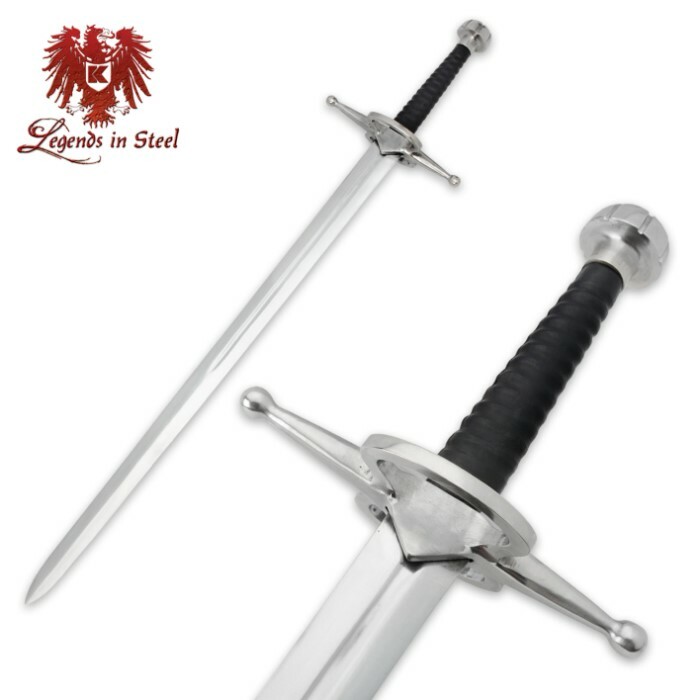 This a really good sword, for $10-15 more the manufacturer could have added a leather or hard wood sheath that would have made this a top seller. But as usual, the idiots end up in marketing. This is my first sword purchase from Bud k and I am pleased. Of course we live in a world where you get what you pay for and for me this holds true to this sword. If you Remember that this sword is only 50.00 then you will be ok. For me this is strictly for display and not to live out some medieval fantasy. I don't mind the non sharpened edges for it gives me a choice on whether to sharpen it or not to. Thanks for a great product at a great price. It would be nice to see some floor stands for these beauties because all i see are samurai stands in the catalog. I really like the simple design of this sword. Quick and painless delivery as always, courtesy of TrueSwords and UPS. A few things to note about the sword for anyone looking to purchase one. The blade comes completely UNsharpened (which I actually prefer for this type of sword). The sword is thinner than anticipated and is made of stainless steel (not carbon) and will bend and wobble a lot easier accordingly. The blade is slightly loose and has "INDIA" inscribed roughly just above the guard. Also, the sword does NOT come with a scabbard of any kind. Overall, for $50, I'm satisfied with my purchase. A nice decorative/prop piece to have around. I just received this about a week ago, so far I am in love. The fitting are solid and look to be hand made, nice thick steel. The blade is really nice, the edge is dull but if you wanted an edge wouldn't be too difficult. The problems, well with any sword you will find some fun little issues, the grip ribs stop too soon so there is a gap between the guard an the ribs creating a valley. I am gooing to fix this with some nice purple thread which should look nice. There is still a wooden core and leather wrap just no rib. The polish is a little rough, I can fix it no problem but the sword makes up for it in it's size and overall awesome. all in all some issues like the strange India sloppily engraved on the blade, but I love it.